Rick (Tight Head Prop Forward), Princeton, NJ, 2010. Archival ink jet print. 20 x 16 inches, edition of 5. Adam (Fullback), Princeton, NJ, 2010. Archival ink jet print. 20 x 16 inches, edition of 5. Zak (Second Row, University Team Captain), Princeton, NJ, 2010. Archival ink jet print. 24 x 20 inches, edition of 5. 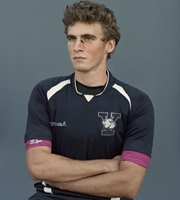 Ryan (Fullback, University Team Captain), New Haven, CT, 2010. Archival ink jet print. 20 x 16 inches, edition of 5. Arturo (Flyhalf), New Haven, CT, 2010. Archival ink jet print. 20 x 16 inches, edition of 5. Dan (Wing/Fullback), New Haven, CT, 2010. Archival ink jet print. 20 x 16 inches, edition of 5. Black is the Day, Black is the Night is a conceptual exploration into the many facets of human identity using notions of time, accumulation, memory and distance through personal correspondence with men serving life and death row sentences in some of the most maximum security prisons in the U.S., all of which had served between 13-26 years at point of contact. The show opens May 8th and runs through July 5th. Amy Elkins has won the 2014 Aperture Portfolio Prize. The Aperture Foundation editorial and limited-edition staff reviewed close to one thousand entries before selecting Elkins' two submitted portfolios, Parting Words and Black is the Day, Black is the Night, for the top prize. 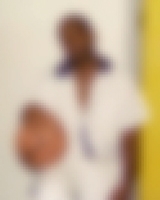 The artist will receive a cash award and an exhibition at the Aperture Gallery in New York. Work by Amy Elkins is featured in the exhibition Face It, at the Rockland Center for the Arts, in West Nyack, NY, on display through April 14. The exhibitions of photographic portraiture features artists who blur the line between editorial photography and fine art, and includes Valerie Belin, Robert Bergman, Elkins, Jill Greenberg, Steve Pyke, Tomoko Sawada and Martin Schoeller. Work from Elkins' series Wallflowers was also recently acquired by the North Carolina Museum of Art. Works from Amy Elkins' new project Elegant Violence will feature in The Sports Show, a group exhibition at the Minneapolis Institute of Art, opening February 19. The exhibition will explore the role of photography in the transformation of sports from leisure activity to massive worldwide spectacle. Additionally, a two-person exhibition - Jen Davis and Amy Elkins: Looking and Looking - will be on display at Light Work, in Syracuse, NY from January 17 through March 13.